Exceptionally Clean! - On the Water - Convenient Location! 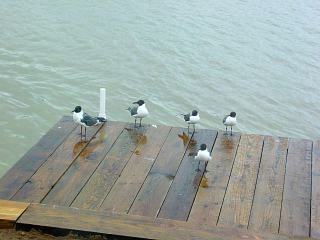 Matagorda is a Fisherman's and Birdwatcher's Paradise! Please call the number listed on this website to make your rental reservations. please call 713-301-9474.. Ask for Adrienne. Matagorda Beach and Bay....Happy Fishin' , Sunnin' and Relaxin'! Where better than at the "Crooked Cabin" on the Colorado River! Two bedrooms, one bath, large kitchen, spacious den with a GREAT view of River and fishing pier, cold A/C, lighted fishing pier with fish cleaning table, bulk head, electric range, refrig, microwave, TV, washer and dryer, all towels and linens furnished, sleeps six persons with privacy (has 2 double beds, 2 queen beds). 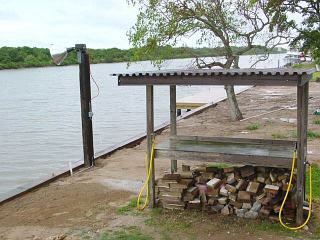 Also available for your convenience are lawn chairs, BBQ pit, fire ring for "camp fire" out near the water. House has it all....even toiletries....just bring your fishing tackle, tooth brush and a change of clothes! See to believe! 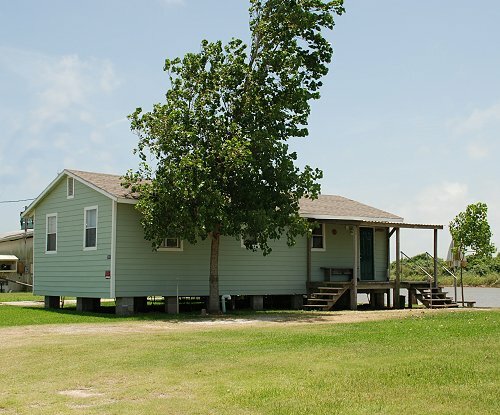 We are conveniently located only minutes from local restaurants, convenience stores, boat ramps, and bait camps. Nearby Matagorda Bays and Beach offers visitors beachcombing, shelling, birdwatching, fishing and swimming and both are only a few minutes away by boat or car. Weekend Rates: Friday night and Saturday night, with a Sunday noon departure $425.00. ** All rentals are subject to State of Texas Hotel Tax. This is for ALL stays, regardless of length of rental. NO exceptions. Advance rental reservations are recommended. ALL rents due must be paid in FULL prior to check in. No refunds will be given for early departures or for weather related reasons. Deposits are not refundable for cancellations unless such occurs 90 days prior to your arrival. Deposit Refunds: Upon inspection of property, deposits will be returned within 10 days. If any inventory is found to be missing, damaged or destroyed, entire deposit will be forfeited. The size of your group must be included with your reservation. Check in time and check out: 3:00 PM check in, check out by 12:00 o'clock noon. No Smoking - No Pets allowed. Please take your trash with you when you depart the property. Please respect our "Home Away from Home". It is the renters responsibility to leave the cabin as clean as it was when you checked in. We truly hope that you will enjoy your stay at our cabin and appreciate your patronage. We accept cash, money orders or traveler checks. Matagorda Beach and the Matagorda Bay area offers you Beachcombing - Surfing - Surf Fishing - Wade Fishing - Biking - Beaches - Swimming - Boating - Kayaking - Pier Fishing - Hiking - Sailing - Jet Skiing - Seafood Restaurants - Water Skiing - Deep Sea Fishing - Bird Watching - Fun In The Sun! For availability, rate info and specific questions about this property, please call or email the owner of this property at number listed here on this webpage. No use of any content found on this web page may be made without the consent of webmaster of this site.